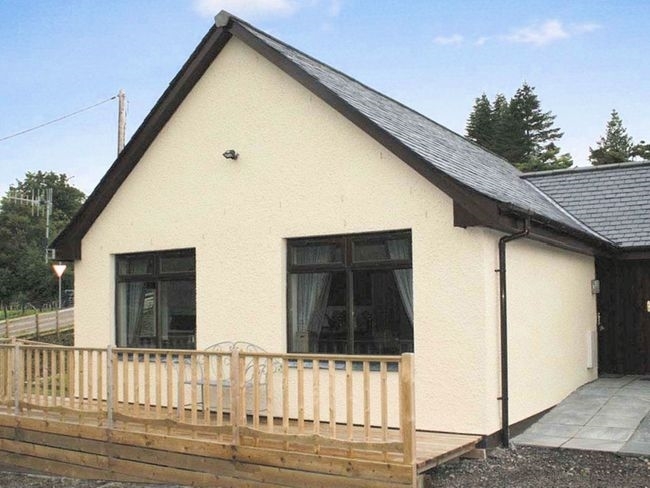 Located 10 miles south of Fort William, in a traditional scattered crofting community, these two attractive semi-detached cottages are purpose built to the highest standards, built with every convenience adopting comfortable furnishings with lovely finishing touches. Positioned just a short walk from the shoreline of Loch Linnhe this beautiful part of Scotland offers a wide choice of activities including winter and water sports, mountain biking, climbing, walking, diving and golf. Fort William nestles under Scotland's highest mountain Ben Nevis and at Corran a ferry gives you the chance to experience the remote and beautiful Ardmamurchan peninsula crossing over to the Isle of Mull. Shared utility room: drying room with tumble dryer. Outside: large shared grounds with a small stream. Amenities: Wi-Fi, bed linen, towels, gas for cooking and oil-fired central heating included. 1 well-behaved dog welcome. Additional info: cottages accessed on ground level by ramp. Location: Corran car ferry crosses to Loch Linnhe 2 miles, Glencoe 6 miles, Kinlochleven rock climbing school 12 miles, mountain biking at Aonach Mor 20 miles, Oban 1 hour and Loch Ness 1.5 hours away. Arrival: 4pm. This attractive semi-detached cottage offers TWO bedrooms: 1 double bedroom with king-size bed, Freeview TV/ DVD, CD and en-suite shower room and 1 double bedroom with Freeview TV/ DVD and CD. Bathroom: shower room with WC. Lounge/kitchen/diner: with Freeview TV/ DVD, Wi-Fi and CD. Kitchen area with gas hob, electric oven, fridge, freezer, dishwasher, washing machine and microwave. Outside: raised decking with outdoor furniture.